Go Oldent! Cool looking bridge-to- be! 1 The the weight of the bridgespan will overcome the friction of the base causing the bridge to sag. 2 I do not think magnets will have enough strength to hold the parts together. The magnets barely hold the fire trap to the walls for example. Even if the magnets were replaced with eye hooks the bridgespan will be too heavy.Friction and gravity are issues. Weight could be added to the base. However, if I wanted a log bridge I could build one and have it tomorrow. As far as we can tell your right, weight is the major issue, there are ways to deal with it but none seem to be simple. Still confident that a solution will be found even if we have to sort it ourselves. We love breaking stuff, which is just as well with our ham fisted non opposable thumbed paws. 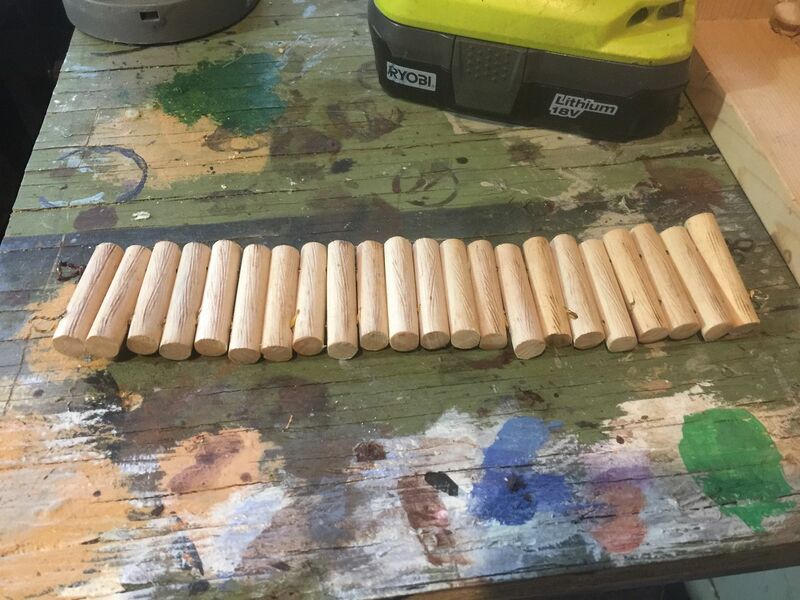 And I don't think there is anyone on the forums who would not believe you could make a log bridge in an afternoon. Even the Spam bots know it. I used homemade twisted wire rope and hooks. I can make short bridge spans the same way. In fact it would be helpful if you can put those pesky bots in the glitter dimension of your Tree of wondrous horrors, that would teach the buggers! This off topic I will add the how to to my tip thread. I only have a couple of sets from the Dungeons of Doom restock, so I'm looking to fill out my collection with some cavern basics, a couple of those awesome crystals, and a reasonable amount of Dreadhollow, since the forest theme is flexible. I'm really glad they included forest pieces in this kickstarter. I tend to run big games (8+ players) which can be a tight squeeze if all your chambers are small. I've found I need to invest extra in floor pieces to get big enough rooms. A few things are still up in the air. I'm not over-investing in elevation, bridges or dressing pieces. I may change out Universal 4-6 for just some Cave Floors, dial down the Crystals a bit, or change up the Dreadhollow order to fit my budget. DF magnets often seem too weak. I wish they would use stronger ones. I was initially keen on the suspension bridge, but given the potential issues and the other bridges available in KS4, KS5, and KS6 (natural bridge), I think I may drop it. If it turns out well, I can always pick it up from the store. Eventually. of course, for some reason we were thinking Natural Bridge, the Suspension Bridge never crossed our minds! Confident DF will sort the sag issue out as Nate has already acknowledged it, we like it because of its collapsibility and we have ideas as to how we can level it out, something as simple as a plastic ruler would do the job. We would suggest 90% is to hard, but its difficult without having any DH trees to hand. Lady S, we think, may have suggested that 50% gives decent coverage without making the tiles almost unplayable due to tree density and subsequent tree fiddling (is that a thing?). We decide somewhere around 50 to 60% tree coverage for our pledge, but may bump for a few more trees before the PM closes, we will see how our insecurities feel. As you probably noticed there are a few 'painted' sets sprinkled in this pledge. I am getting these sets purely as samples for my own painting. I went hard after the forest sets with I'm guessing 90% coverage for ability to place a tree on every stump - maybe TOO hard. That said I could probably cut back a few tree packs? as I am unsure of how many scatter terrain trees that I realistically will be using at the same time as the tree tiles. Thoughts welcome here. I'll end up buying two or three KS2 Caverns from the store (I have zero caverns right now) to go with the cavern selections above. I really like the elevation pieces and am seeing some nice cross pollination with my Erinthor sets and tree sets! And I don't think there is anyone on the forums who would not believe you could make a log bridge in an afternoon. Even the Spam bots know it. I really wanted everything, I just can't afford any more. To be honest, with this I have spent over $5k on DF stuff in the last two years and I need to curtail my addiction a bit . I have kids who will need to pay for college soon.